Advanced experimental setup of the high force magnetic tweezer device. we use an automatic cell tracker. properties of different cell types. 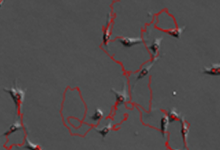 In my work I am focused on cell mechanics, especially the improvement and development of techniques to investigate biological cell functions. Mostly I am interested in cytoskeletal mechanics and in binding dynamics of cell adhesion to proteins. 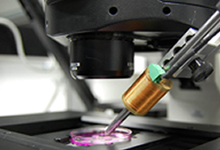 To verify the mechanical properties of the cytoskeleton of cells a high force magnetic tweezer device is used. Smal magnetic particles of 5µm diameter are bound via focal adhesion complex to the actin cytoskeleton. 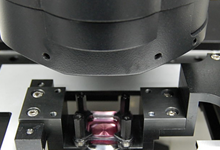 A precise magnet applies forces of up to more than 200nN to either easure the stiffness of the cell or the adhesion strength. Application of external stress to cells leads to alterations in their probabilities. 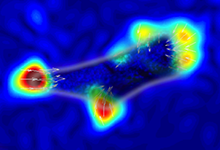 Like in physiological environment cells are permanently exposed to deformations. With the cell stretcher this influence can be investigated with the use of flourescent chemicals the viability of cells due to that stress can be visualized. Cells can sense and also generate stress. By contracting their cytoskeleton they are able to generate forces to their underground where they are connected through their focal adhesion complex. This method makes it possible to measure this contractile forces by using gels which are deformed by the cells. Cell movement is very important issue and can be investigated through live cell imaging. With this method any cell line can be observed over several days under physiological conditions. Using recognitional software it is for example possible to track their movement and thus their speed. © Copyright 2013 - Navid Bonakdar. All Rights Reserved.